Home Barefoot Relief Is Just An Hour Away! Relief Is Just An Hour Away! I recently posted about transition in my newest horse, Khopy. I decided to give him some longer-term support, by gluing on Easycare Glue-On Shells with Goober Glue. I trimmed him just a tad (backed up his toe) and slapped on some shells with Goober Glue straight out of the gun. 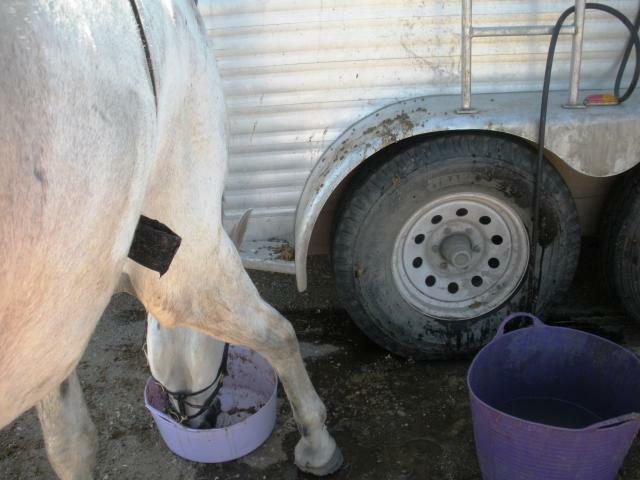 I would normally mix the glue with water, but given the fact this horse actually STANDS STILL, I wasn’t too concerned. 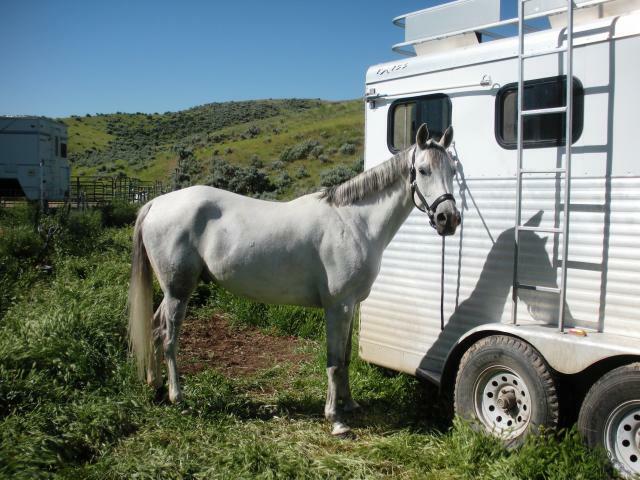 Khopy stood like an angel at the trailer while the glue set, which took about 20 minutes, and took off bucking and galloping in his pasture after fully setting in about two hours! 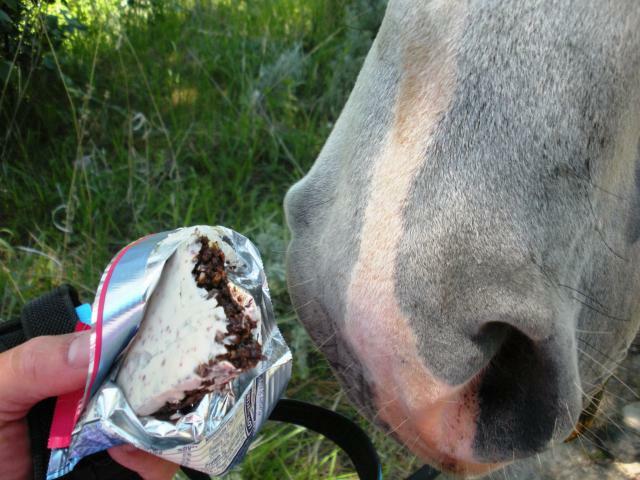 I glued on boots Friday afternoon, and had a ride planned with my pal on Sunday. 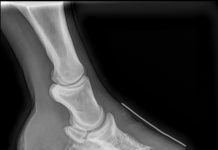 Exercise is so important during the transition process, as it stimulates the hoof to grow and gets the horse used to moving barefoot, even in boots. We headed up to the trail-head at the base of the mountain and up we went!! We looked at the cows…. Khopy felt great, and we kept the speed very slow, always walking over the rocks and on the downhills. As always, what a great ride!!!! I’m starting to get to know this horse and appreciate his quiet, thoughtful nature. While he can be moody and touchy, he really seemed to enjoy himself on our outing. At one point during our climb to the top, he slammed on his breaks and turned right, quick! I thought he was spooking at something to the left, but quickly realized he just wanted to take in the view. We had come to an incredible clearing, looking all the way down to the valley, and he just looked and looked. 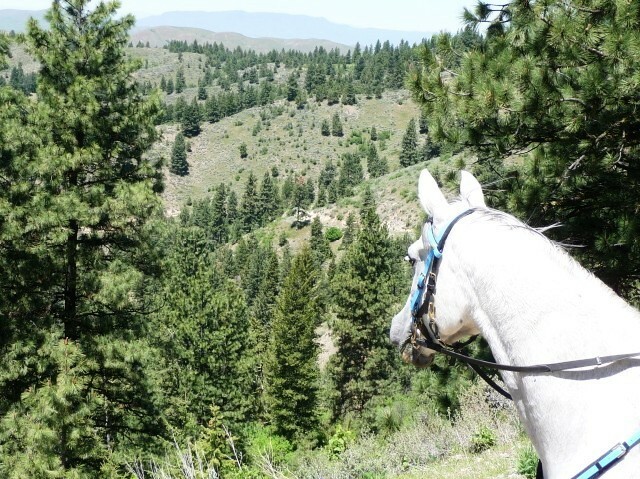 When he had enough, he straightened himself out and started back up the trail. Pretty cute!! Khopy takes in the views. 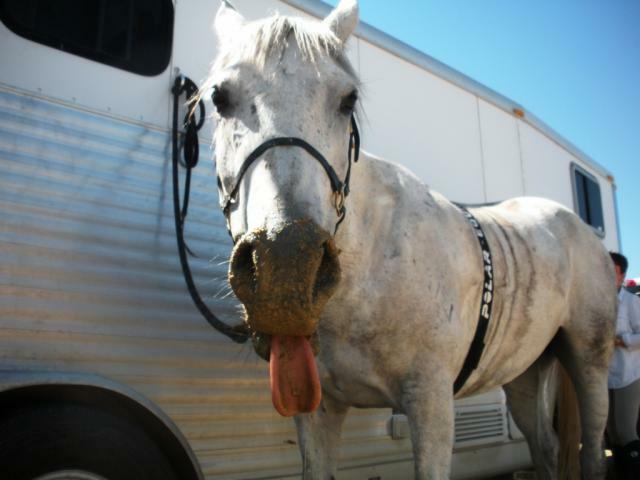 Back at the trailer, the ponies make a mess, and below, Granite tells us what he thought of the s.l.o.w. ride! On Wednesday, we had our weekly dressage lesson. My trainer didn’t notice his glued-on boots, but commented several times on his progress and his movement that day. He moved freely in our extended trot passes across the diagonals, and had some really great lateral work. Thank you Easyboot!! 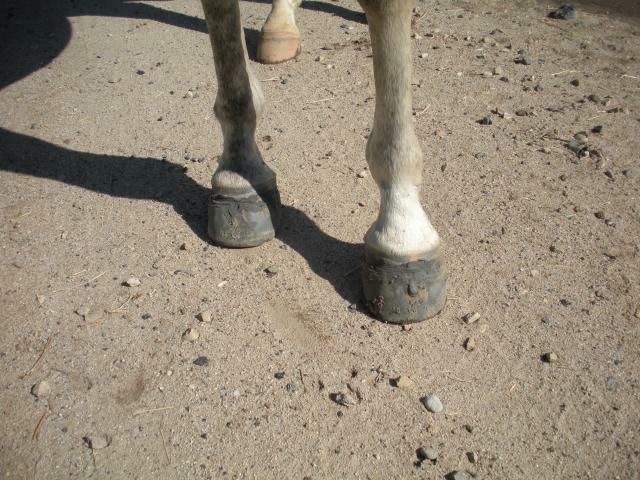 I pulled Khopy’s boots yesterday, ten days after I applied them. It had rained the night before, so the ground was still forgiving. His feet really weren’t any softer than my other gelding who has been out barefoot, because of the rain. Khopy moved comfortably across the gravel and took off up the hill in his pasture after turning him out. I will re-evaluate him tomorrow have no problem re-gluing boots on again this weekend if he needs more time. I transitioned Replika last fall by gluing and re-gluing boots for a couple weeks. 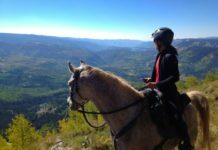 Two months after I got her, she went on to complete 205 miles in four days at the Owyhee Canyonlands 5-day ride. I can’t wait to look back on this when I am able to ride Khopy barefoot over all terrain like I know can Replika. And no, I did not buy Khopy just because I already had a Replika!! My friends joke that I should change Topper’s name to Duplicate or something like that!! Eleven days, post gluing. We did three rides plus several sessions in the round pen. 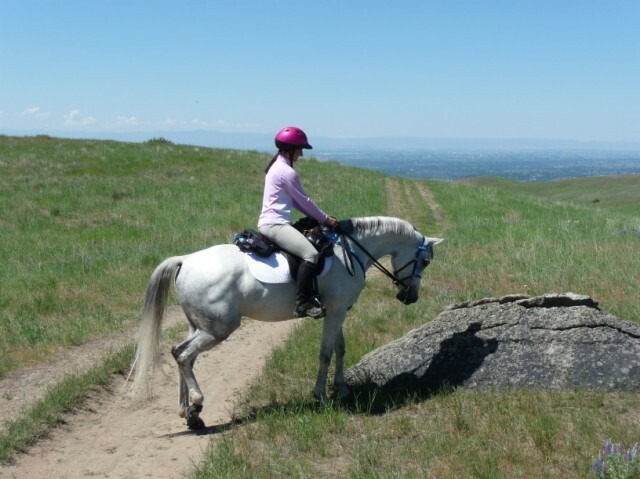 Rides included an 18-mile trail ride, a one hour lesson in the ring and a 10-mile trail ride. Not to mention all the miles this guys puts on his boots galloping around the 25 acre pasture several times day!! The quarters are starting to loosen up, but they were still on plenty tight! I know it’s more work (for the owner, that is!) to glue on boots, and sometimes it *would* be easier to just call out the farrier and have a set of shoes nailed on, but it’s really worth the effort for me. I also hope that people really look at the cost, and understand that it isn’t more than the cost of shoeing. Four Glue-On Shells will run you $92, and a tube of Goober Glue, which is extremely soft and provides excellent support in the sole area, will cost you $15. That is $107 for instant relief! 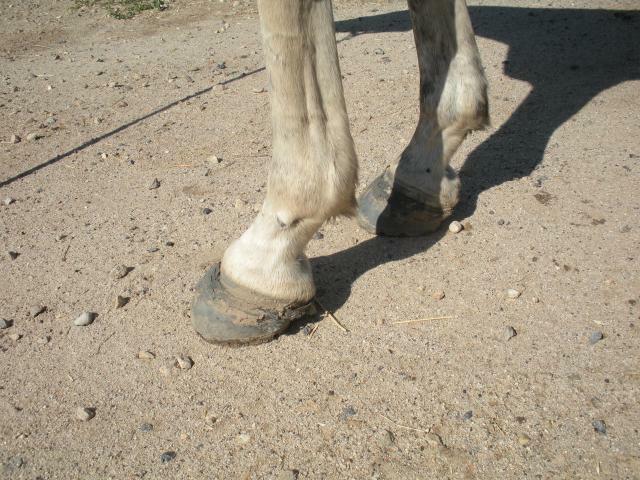 I know in our area, a good set of shoes will run you $100-$125, and after six weeks it’s another check to the farrier. I think the BEST thing about gluing is you can re-use the shells several times for rides and even more for therapeutic use as described above! They really end up being the cheaper option! With the different options in the market today, I hope people step up the face the challenges found in some transitions, armed with glue and shells!! 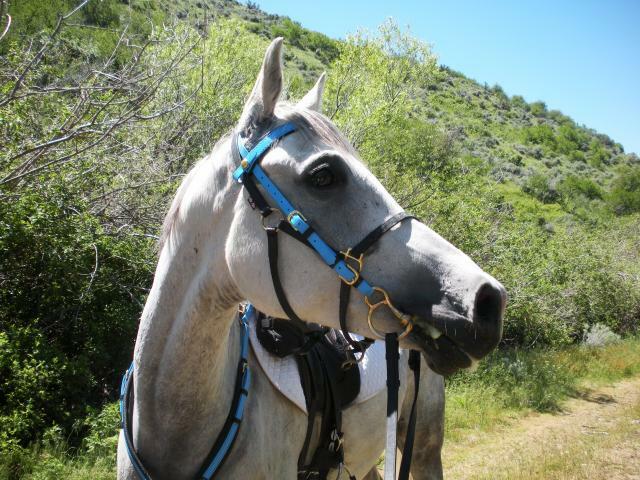 It feels GOOD to be able to make my horse comfortable, with a long-term goal of bare feet in mind!! 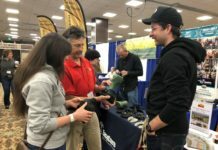 Next articleBarefoot Hoof Care – Why Barefoot?